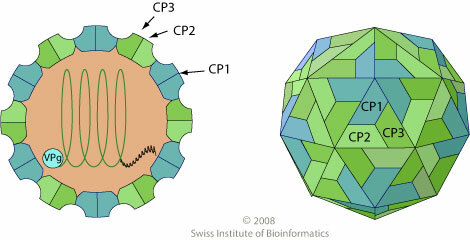 Non-enveloped, about 30 nm in diameter, T=pseudo3 icosahedral capsid. Genome segments are encapsidated separately into two different types of particle similar in size. Segmented, bipartite linear ssRNA(+) genome composed of RNA.1=7.8 kb and RNA-2=5.4 kb. Each genomic segment has a VPg linked to its 5' end and a 3' poly(A) tract. The virion RNA is infectious and serves as both genome and mRNA. RNA-1 and RNA-2 are translated into two polyproteins, which are then processed into functional proteins. RNA-1 encodes proteins necessary for replication, while RNA-2 encodes one or two capsid proteins and product(s) involved in cell-to-cell movement. TRANSMISSION Mechanical inoculation in plant by insects. Vector=whitefly.